I'm getting started on this post early as we are going away for a few days; Again!? - as some people might say. We are heading to Toowoomba, the city up the Range, which holds the Carnival of Flowers each Spring. The gardens are being kept alive with bore and tank water, as we are in the midst of a bad drought out west. We went out to the airport last month, dropping off a niece, so I thought I'd duck into the DFO to grab these. Delicious and nutty hazelnut paste with way more nuts than the usual brand. It actually is quite different, and takes a bit of getting used to; not so sweet, and not so moreish, but healthier perhaps? Not everyone likes their lollies tasting like Granny's drawers (get it? get it? ), but I really love these. We visited the lavender farm at Bridestowe in northern Tasmania. While the flowers were not blooming, and it rained gently, we still enjoyed a cup of hot chocolate overlooking the blooms to come. 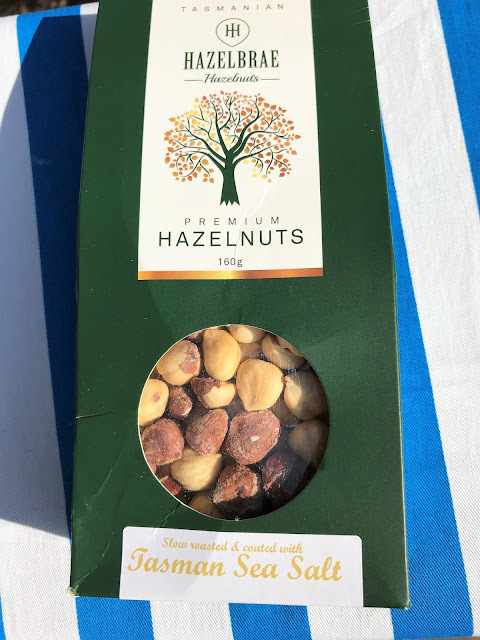 These are prize-winning, lightly salted Tassie nuts. Sooo fresh and light and nothing like the ancient stuff you buy in the shops. These were ... interesting. I wouldn't choose them again, but they were okay. 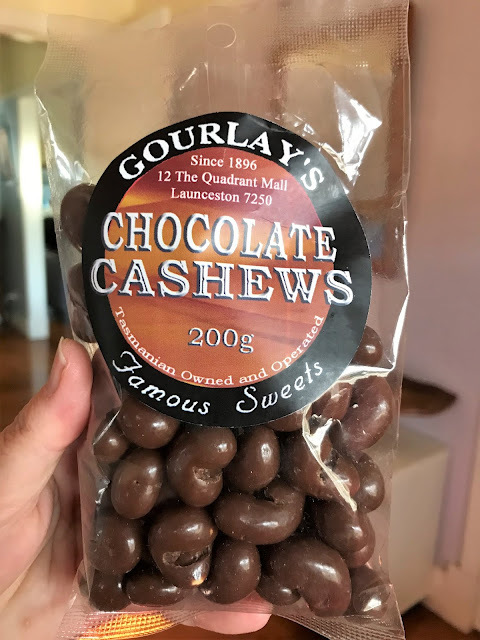 The cashews were soft in texture, so with the soft chocolate coating, they became an exercise in sucking rather than chewing. Perhaps a toffee or brittle coating would be better? One of our fave cafés in Hobart is Jackman & McRoss, where the bread and pastries are fabulous. Cold climates always have better baked goods, don't you find? This is their house-made onion jam, great on all sorts of dishes. I have a big collection of salts of varying flavours, so I couldn't resist adding these to it. Can't wait to try the beetroot and radish one! I bought this at the Launceston Farmers' Market, which was a really fab market. They had a lot of different produce to the kinds we get up here in Brisbane. Well, not surprising as we are in a sub-tropical climate, whilst they are in a temperate one. Our friends The Barrel-Makers (not their real name or occupation) decided it would be fun to buy me this at the Salamanca Market in Hobart. Yep I think you're right; this has to be the weirdest, most crazy thing you've ever seen. Those are seagulls believe it or not. And yes it really is that wonky in shape. But thanks Miss M; it's great! Feel free to join in IMK this month everybody with your own wonky, weird stuff. I would love to have you here. (Linky finishes on the 13th of the month at 5pm, FYI). Here are the options for adding your IMK posts. In order for me to add your posts (i.e. if you prefer that I do it), I must have your email address. Inlinkz now demands one! I used to be able to leave it blank, but no more. I am happy to do this for you, but just let me know and leave your email address too. 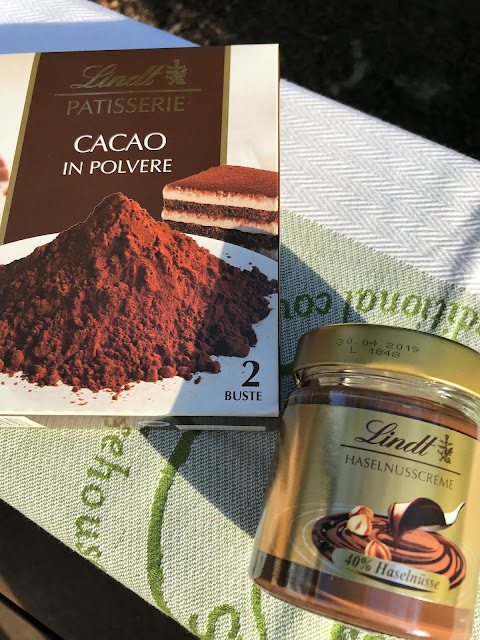 The Lindt powdered chocolate looks very appealing, I might have to investigate these as I'm sure it would be the perfect topping for a Tiramisu or powder for a chocolate cake. I gather these are from the Lindt outlet shop. Hi, Sherry! Hope you're having fun on your latest get-away. In my mind, there can never be too many. GO -- enjoy! For some reason (probably due to operator error) I'm having technical difficulties trying to add my post to your link-up Will "try, try again." In the meantime, what a wonderful bunch of goodies you've featured this month! I'm especially enamored of your flavored sea salts and that gravy boat is the CUTEST! Apparently things sorted themselves out since my last message. :) Carry on! Such interesting items! Yes we don't get choc coated cashews but maybe there's a reason for that. I love it when macadamias have that middle layer of toffee. Greetings from an internet cafe in Friday Harbor in the San Juan Islands in the Northwest corner of the US. Thanks for adding me to IMK, and enjoy your trip! I lived in Toowoomba many years ago when I was a cook at a boarding school there. Always loved the Festival of flowers. Enjoy. You certainly have lots of yummy goodies in your kitchen. Enjoy your holiday, I'm sure it will be nice. I am interested to read about what you think of the beetroot and radish salt. I have a beetroot salt and it makes everything pink. 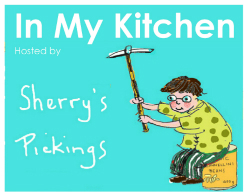 Some really great stuff in your kitchen this month! 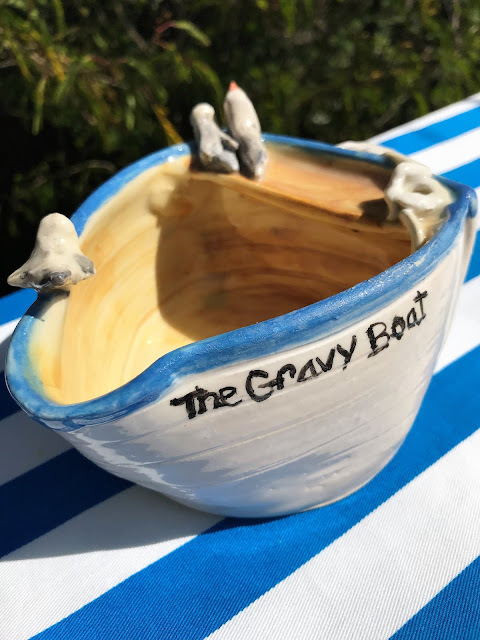 My favorite has to be the gravy boat -- funky! And very cool -- I love its whimsy. Good stuff -- thanks. We're visiting Tasmania next year and you've really whetted my appetite! 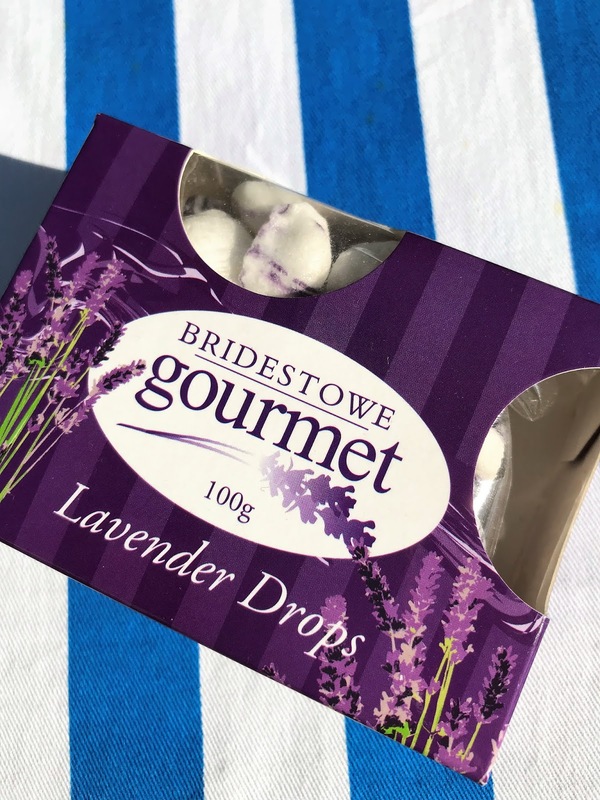 Not sure about the lavender drops but everything else looks delicious. Honestly the lavender sweets are delicious. Have a great trip. What great foods! We were lucky enough to visit Tasmania last year during our AU and NZ trip. We went to the Bonorong Sanctuary where I got to pet kangaroos and my first wombat named Maria! That gravy boat looks like great fun. I imagine you could not bring it out without telling stories. 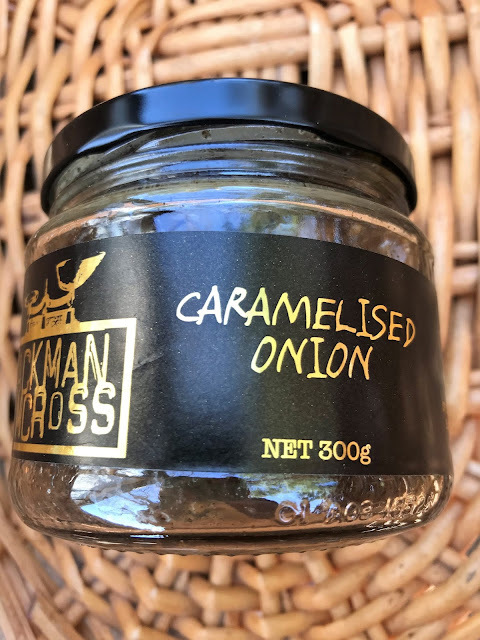 I am a fan of jackman and mcross from visiting hobart many years ago so would love to try their caramelised onions. 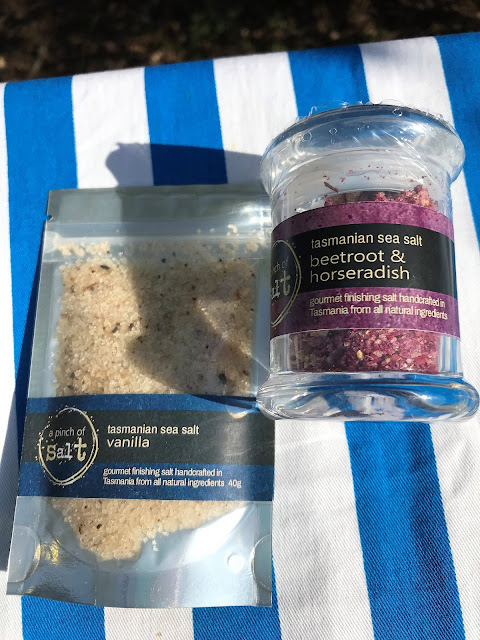 I really love the sound of those salts (the beetroot one is so beautiful) and am curious about the chocolate cashews and lindt choc hazelnut butter. Enjoy your travels this month. I have linked to my IMK post. Beetroot and horseradish sea salt and the lavender drops have my attention, and I absolutely adore the gravy boat. I don't have much to share this month, but I still Hope to join in IMK this month. Great to see you here. I’ll have a go at commenting on your post. Cheers sherry. 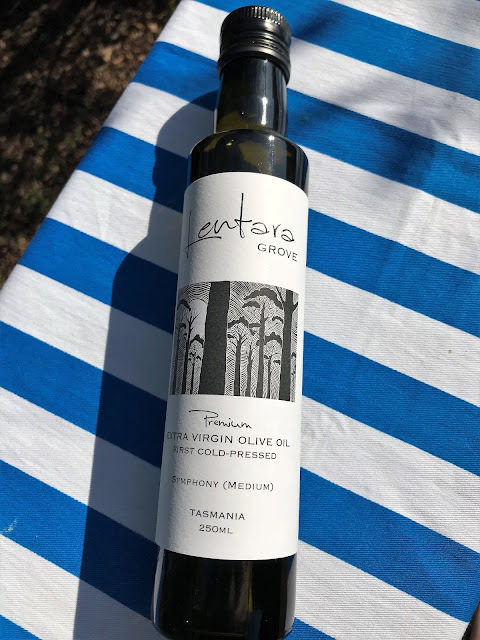 You have some great items from Tasmania! Those hazelnuts and sea salts look great, and gotta love that gravy boat! Have a nice trip again! I have also added my link for October. I love caramelized onion jam on grilled sandwiches made with good sharp cheddar, yum! Those salts sound interesting, how would you use the beet salt? Looking forward to hearing the recipe. Tasmania is on my list to visit, it sounds like a foodie paradise. Have a wonderful holiday and thank you for hosting In My Kitchen. Enjoy Toowoomba! I much prefer the Lindt spread since as you say not as sweet and I like the much stronger nut flavour. Good morning. I linked up but didn't have time to comment as we evacuated from a hurricane. Love the items you picked up at the airport. The hazelnut spread looks delicious.